This is the third post in a series on salsas. Salsa isn’t just for corn chips any more. This was my sudden mind-blowing, earth-shattering realization. It came way back during my college days after a working interview at one very famous Southwestern restaurant. They fed me dinner—a grilled tenderloin steak smothered in a smokey salsa (the very one, in fact, that inspired me to create this Fire Roasted Salsa recipe)—in exchange for my night’s work. I had only ever eaten steak plain, and my life would never be the same. I got the job. But more importantly, I opened my eyes to the possibilities of salsa. Preheat the broiler. Arrange the tomatoes on a foil-lined baking tray and broil for 14 to 16 minutes, or until the skin is charred and blistered. Using tongs, give the tomatoes a third of a turn and broil 6 to 7 minutes more, or until the skin is charred and blistered. Give the tomatoes a final third of a turn and continue to broil another 6 to 7 minutes, or until the skin is charred and blistered and the flesh is soft. Let cool to room temperature and skin and seed the tomatoes. 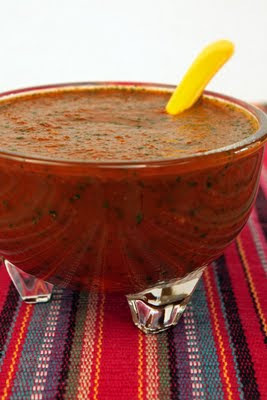 Combine the tomatoes, onion, chipotles, cilantro, cumin, and lime juice in a blender and blend until smooth. Season to taste with salt. Makes about 1 ½ quarts. Heat level: medium/hot. If you like it hotter, add more chipotles. This smokey salsa is great on everything from chips to quesadillas and fajitas to breakfast tacos. And it’s particularly delicious served as a sauce with grilled rib-eye steaks. If you prefer an even smokier flavor, grill the tomatoes instead of broiling them. It’s not absolutely necessary to peel and seed the tomatoes, though it does give the salsa a nicer texture. Keeps for several days tightly sealed in the refrigerator and freezes well. Serve warm or at room temperature. This sounds like a great salsa! Roasting the tomatoes gives them great flavor, and I love chipotles. 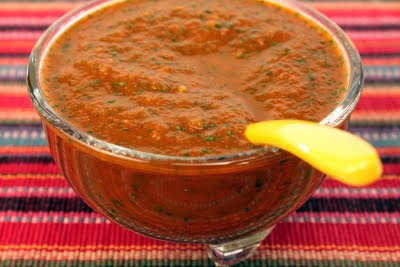 I love salsa and this looks wonderful! I love salsa. I have been into tomatillos too this summer. I have never made salsa believe it or not! Fire roasted sounds delicious! DO not Put in blender! Keep it chunky.